A new high-speed international train service is started on December 17, 2016; carrying passengers between capitals of Russia and Germany. Train No. 13/14 Swift left Moscow's Kursk station on its first run between the Russian capital and Berlin to a ceremonial send off. The event was timed to celebrate High Speed Day in Russia, which began with the launch of the Sapsan services. The President of Russian Railways stressed that the new Swift international train will offer more comfortable travelling conditions to all passengers, including those with disabilities, since it provides for a greater number of compartments for people with disabilities. 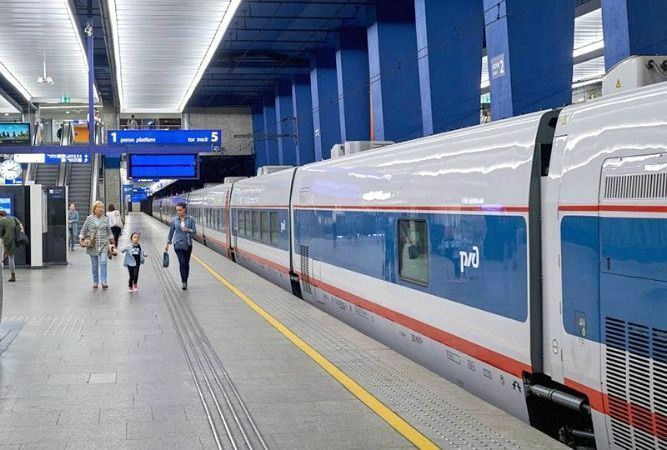 Russia's Minister of Transport Maxim Sokolov noted in turn that "the journey to Berlin will now take a little over 20 hours, almost five hours less than before. I would like to congratulate Russian Railways and all users on this remarkable project and thank the manufacturers and all our colleagues in Russia and abroad. This train will now be our new joint direction with regard to international activities." This Moscow-Berlin service arose due to rising passenger demand for rail transport between Russia and Europe. For example, 561,400 passengers travelled abroad on Russian long-distance trains from January to November 2016, over 9% more than during the same period last year. Passenger numbers between Russia and Germany reached 25,800, which is 35% more than during the 11 months of 2015. This is the first time a Russian train has been formed which consists of rail carriages fitted with equipment for enabling an automatic change of gauge widths. As a result, the time spent at the interface between the two gauge systems in Brest on the Belarus-Polish border will be cut sharply. Previously, the bogies had to be disconnected and the locomotive and carriages jacked up so the wheelsets could be slid out and the bogies with the other gauge slid in and attached. As a result, changing the wheelsets of international trains crossing the border with the EU takes about two hours. The Swift trains, by contrast, need just 20 minutes to traverse a specially equipped conversion device to switch from the Russian broad gauge of 1520 mm to the narrower European track of 1435 mm and vice versa. The Swift service will run twice a week, on Saturdays and Sundays from Moscow and on Sundays and Mondays from Berlin. The run from Moscow to Berlin takes 20 hours 14 minutes. Each train consists of 20 carriages: five second-class cars with 18 berths and four-berth compartments; two carriages with seating in first class (20 seats in each carriage), a carriage-bar and restaurant car; four first-class carriages (12 berths, double compartments); three VIP-class carriages (6 berths, double compartments equipped with a shower and toilet), including a second-class compartment equipped for persons with disabilities; 2 VIP-class carriages (10 berths, double compartments fitted with a shower and toilet). The train (head and tail) also includes technical wagons to ensure the functioning of the environmental support systems. Train passengers will be provided with Wi-Fi access to a multimedia portal with Internet access. The portal provides essential passenger information and news, such as the route details and timetable, the restaurant carriage menus and purchasing train tickets, as well as films. Passengers with 1st class seating will also be issued with tablets to view multimedia content. The introduction of technical innovations in the train's design has facilitated an increase in passenger travel comfort and in particular reduced the effect of the centrifugal force on passengers when the train takes tight curves at speed.